Lumpia Wrapper Making Machine – Acquired In More Than 106 Countries. 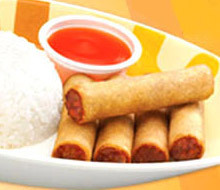 Jollibee, a listed Filipino food service giant, accounts ANKO as their lumpia making machine (spring roll machine) quality supplier. ANKO is a leading Taiwan food machine manufacturer with more than 30 years of experience; their dedication to developing sophisticated ethnic food making machines and food processing machines allowed them to serve clients in more than 106 countries. In 1985, Jollibee sent two managers to Japan and Taiwan for their automatic lumpia-making machine project, to cope with their increasing lumpia demand. 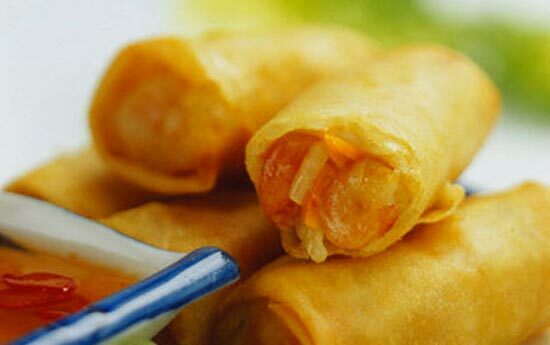 Since lumpia originally came from Asia and is also named lumpiang Shanghai in China, Taiwan and Japan are already well-known for manufacturing spring roll making machines. Therefore, finding a supplier from both countries seemed reasonable. However, Jollibee had hard time finding a suitable Filipino lumpia-making machine manufacturer because of mold design obstacles. When Jollibee contacted ANKO, ANKO realized the difficulties involved in Jolibee's lumpia project; on the other hand, they also understood the international market demand. As a result, ANKO accepted the challenge and submitted a flow chart, lumpia recipe, machine specifications and price list to Jollibee in ten days. After receiving confirmation and deposit from Jollibee, work started. 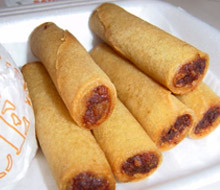 The Filipino lumpia production line was completed in 60 days, after many food forming tests, food making tests and modifications from the engineers and mould design teams. 60 days later, Jollibee's supervisors came and tested the machines; more communication and amendments were made. Subsequently, an automatic production line with great production capability and the delightful taste of lumpia earned 100% satisfaction from Jollibee. 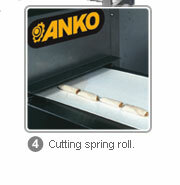 Today, ANKO's lumpia maker production line is not only sold in Asia, it is also acquired worldwide. 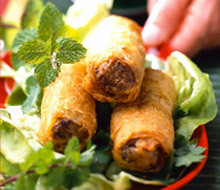 Lumpia literally means deep fried Filipino spring rolls, which contain meat, vegetable and other variants depending on the region and cultural differences. 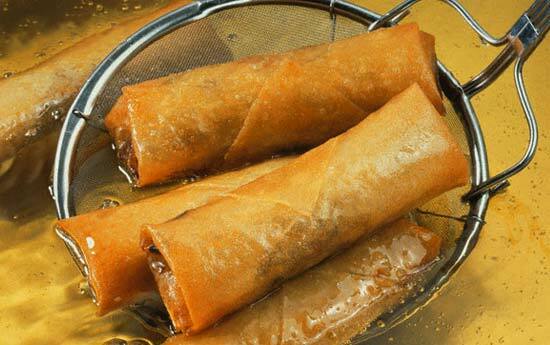 To build a functional lumpia making machine, a few considerations should be taken into the design - the pastry recipe, thickness of wrapping, deep fry temperature, recipe and the size accuracy of each lumpia. 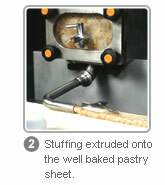 For the lumpia wrapper making machines, the stuffing is wrapped with thin layers of dough, which makes them fragile. Therefore, well-designed machines should be tested numerous times to ensure their persistence of quality. 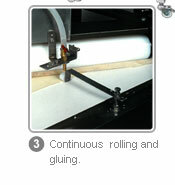 One of the difficulties in designing a lumpia making machine is the length and accuracy of the rolls. 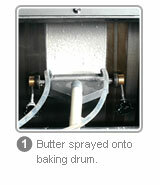 Hence, it requires a precise PLC parameter adjustment. 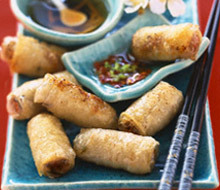 Finally, conventional Filipino lumpia taste would be the key to winning Filipino eaters' hearts. Now, ANKO is the only food making machine supplier who's capable of designing a production line which operates automatically. 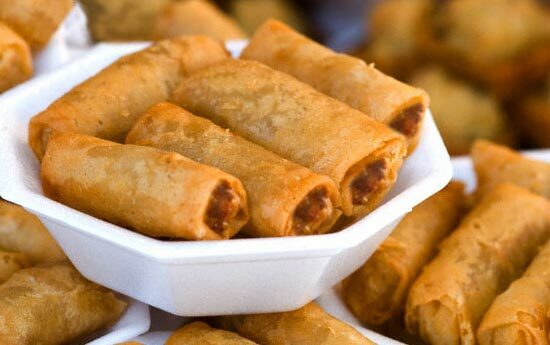 Engineers in ANKO all have years of seasoned experience, their lumpia production line is designed to be completely automatic, from mixing, feeding, baking, stuffing, gluing, rolling, cutting, packing and freezing. Furthermore, ANKO's complimentary of Filipino recipe is always a value-added service; many food manufacturers are able to increase their revenue by providing sophisticated and delicious food. ANKO conquers what other manufacturers can't do and makes everything possible.